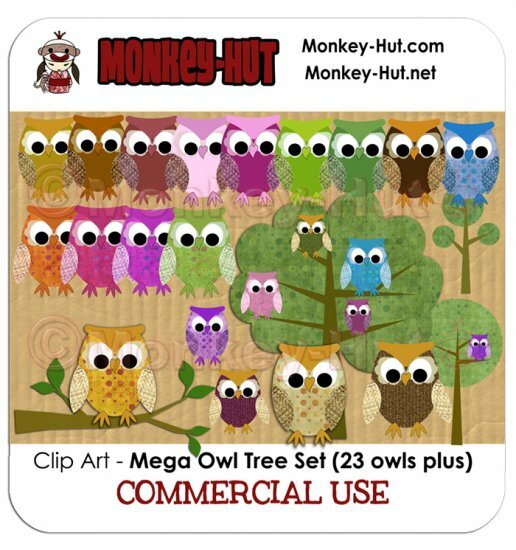 This wonderful huge set of owls is from my original digital illustrations. They come in various beautiful colors and poses along with trees and a tree branch. There are so many possibilities!!! Please note: the clip art is not shadowed. Shadowing is shown on some of the items in the preview to show the possibilities. for a total of 27 graphics!!! Each clip art is presented in a transparent colored PNG format and high quality 300 dpi resolution and it's perfect to use in most graphics programs.. This listing is for LIMITED COMMERCIAL USE. Your purchase of a LIMITED COMMERCIAL USE item gives you a one-person, non-transferable, non-exclusive SMALL SCALE commercial license to use these image files for the allowed uses defined below. If you have ANY questions as to what is and what is NOT allowed, please do not hesitate to contact me at info@monkey-hut.com or monkeyhut@ gmx.com .